Thursday night your undefeated Saskatchewan Roughriders open the final season at old Mosaic Stadium. They will host the Argonauts under the lights… at least assuming no confetti canons blow the power again. It’s the home opener, it’s a night game and Friday is a stat holiday… the atmosphere in the stadium should be electric… and inebriated. This will be the first meaningful action for the newly assembled Rider roster (at least the parts of the roster that Jones doesn’t change between now and kickoff). Questions abound on offense and defense. About the only 2 things we are reasonably convinced of is that it can’t possibly be worse than last year and Jones will be wearing black. They will be facing a Toronto team that is fresh off getting embarrassed by Hamilton in their home opener. You can bet Milanovich and Ray will be anxious to get back in the win column. Offensively we don’t get an easy start as they will be facing Rich Stubler, one of the best defensive coaches in the league. The good news is that the personnel at his disposal is not as top tier as he had in Calgary. The secondary features 2 rookies and their starting MLB got injured in game 1. All the chatter centres around Durant but for me the #1 thing is for our O-line to be strong in the trenches. Their success will go a long way to determining our fate this year. They need to give Durant time and they need to power our run game. Durant is a competitor and will want to come out guns blazing but I would rather see us lean on the run game early to take the pressure off him and open up the passing game for him later in the game. I see Bagg being used extensively. He’ll be the new safety blanket for DD on second down. Running and short passes early will open up deep shots to Chiles and Roosevelt later. Defensively the prospect of Ricky Ray and Toronto’s big 3 receivers against our secondary is concerning. That said I think Toronto is in a bit of a conundrum. Their best chance to beat us is through the air (I have repeatedly professed my love for our front 7). But in order to take advantage of that they need to expose a weakness of theirs… pass protection. That O-line gave up 6 sacks to Hamilton despite the fact that Ted Laurent missed the game due to injury. Had Laurent played, Ray may be dead. If they let Cappy and Lemon start pinning theirs ears back then they will be giving up a lot more sacks (particularly if Milanovich is stupid enough to only run 3 times again). The logical adjustment will be to focus on short passes to guys like Whitaker, Coombs and Durie, which is what I would expect them to do. The quick passes will keep our pass rushers from impacting things and those guys can chew up the YAC yards. Sound tackling will be a must. Also our DBs can’t get lazy in covering the deep routes, one guy cheating up short is all it takes for Ray to find a guy for six (I’m looking in your direction Gainey). I also imagine they will run a bit more but keep in mind that in 2015 the only team to run the ball less than Toronto was the Birmingham Barracudas. In fact, since taking over in Toronto, Milanovich has been dead last in rushing attempts all but one season. So the run concerns me about as much as deciding what colour to wear on Thursday. I’m on record as saying I think we get 3 wins in the first half of the season but I think this will be one of those wins. I like how we stack up in the trenches and I think that will be a big factor in this game. It won’t be easy (do the Riders ever do things the easy way?). Forecast calls for mostly ineffective Argo O with intermittent bursts of long passes and 100% chance of me cursing at at least 2 of our DBs. I think our offense will start slow which will put a damper on the raucous crowd but the D with force a turnover and the O will punch it in at some point in the second quarter and it will be game on. I say we go up two scores late and manage to piss away that lead but win a nail bitter in the end. I am jacked to be back in the stands and hear them filled with thunderous cheering as opposed to the quiet disappointed muttering that dominated last year. Bring Em Out! Bring Em Out!! When who should stroll in to speak to the masses? No not Santa, its Rider Prophet you asses! He’s dressed all in black and he’s wearing a frown. But cut Dressler and Chick? You son of a *$*^$!!! But not all bad news, gone Tino Sunseri! He blew up our team and must now build it up. But it can’t possibly be worse than last year… man that was sad! Lemon, Irvin, Capicciotti damn that pass rush is good! Which will cause the masses to get out pitch forks and chains. A west-semi battle against the arch-rival Stamps. Maybe in retrospect it was for the best that Saturday's preseason game wasn't televised. Certainly doesn't sound like we missed much. Durant was rusty but ended up putting together a nice drive at the end of the first half. Other than that the game was pretty much a reminder of 2 things: 1) We are in the middle of a rebuild and we didn't suddenly vault ourselves from awful to Grey Cup favourite. 2) Its preseason, the results don't really matter any more than Grade 4 test scores. So I won't swell too much on the preseason game. I'd rather jump right into to dissecting our cuts and our roster. I'm not sure what the record for most cuts in a season is but you have to think Chris Jones has to be close to matching or eclipsing that mark. Sunday he added 20 more names to a list of cuts that would put Homer Simpson to shame. There were a few names on the cut list that surprised me. Tyree Hollins was the biggest surprise. I thought he was a really good DB. Quite frankly I raise my eyebrow at the notion that Ed Gainey beat him out but I guess I will defer to Jones on that one (he may know slightly more than me about defense). By all accounts Dillon Grondin was having a good camp. Given our lack of depth at Cdn LB I was surprised to see him go even if he was a developmental project. (***Update: Word is Grondin is injured and likely to be back on the roster once healthy). Aaron Picton was a surprise. Again, sounded like he was having a good camp and our Cdn OL depth is just slightly above non-existent. Lastly Marcus White was a mild surprise. He looked good in the first preseason game and was consistently lining up with the 1s (until Jonathan Williams started practicing). There were a couple "big" name cuts but to me they were not surprising. One was Clarence Denmark. I have been saying for weeks that he was in tough. He was a 30 year old import who was not playing with the starters. He was not as good as Chiles or Roosevelt and Collins showed enough promise for us to opt for the higher ceiling of a young guy rather than Denmark who is reliable but has peaked. The other big name was of course Brett Smith. But this one everyone saw coming a mile away. He simply refused to do anything but make one read, panic and scramble. Over and over and over. I bet when Jones cut him he said "Given how much you like running, take this plane ticket and run to the airport. I'm not calling you a cab". QB: We will be fine with Durant. Coleman I think will progress (though lord help us of he gets forced into action early). Despite my fat jokes, I actually think Sims might have potential. The fact that we currently only have 2 QBs on the active roster means that a new #3 is on a plane to Regina as we speak. Rumours are out there that we are trying to work a trade with Edmonton for Jordan Lynch or maybe even Jonathan Franklin (in a deal likely to involve Josiah St John). So stay tuned. More news to come here. RB: One of the few position that I'm concerned with. Steele and Walter are both adequate rotation/#2 RBs but neither are bona fide starting material. I think we currently have a very mediocre running back situation (minus Kendial Lawrence). I hope the plan is to develop a young guy on the PR to eventually take over later this season. WR: Roosevelt will be awesome. Chiles will be fine. I like what Collins showed in limited action. I love our Canadian trio of Bagg, Demski and Chambers. No concerns here. OL: I think our starters will be strong. I really like Andrew Jones as our 6th OL. If we are forced to play anyone beyond him, lord help us. Depth is serious concern.Though at least we have some guys on the PR to develop. Plus King and Vonk on the 6 game will boost depth a bit once they are healthy. DL: Lots to love here. We have Lemon and Cappy at DE with Newsome to rotate... and don't forget about Eric Norwood. Williams and Irvin will be strong in the middle. Kashama is a nice Canadian to have to rotate in. I'm honestly surprised that Leonard and Reaves (both new coverts to DL) made the team. I'm also surprised that Hazime is down on the PR. But again I'll assume Chris Jones knows a bit more about defense than me. LB: I really like our linebackers. Greg Jones will be a tackling machine in the middle. Otha Foster is very underrated. We all know what Knox can do. Eguavoen looks like a talented back-up. Korey Jones will be good on special teams. Only concern here is the lack of Canadians. We have enough at other positions and Newman will likely see time at LB so its not a huge concern but a concern nonetheless. DB: Hands up if you predicted that our starting secondary would include a converted rookie receiver, a guy was in Stampeder training camp and a rookie? I'm slowly starting to warm up to this Francis at safety thing. there will be growing pains but I think he will be good. I love Derrius Brooks. I hate Ed Gainey. He's okay but mark my words he will cost us over the course of this season more than once. I think Cox will be good on the corner (take that as you will). I think adding a vet like Brandon MacDonald is a good move. The fact is, our secondary will struggle early. it will take for them to gel. I think Jones will build a strong unit but it won't be a quick process. Special Teams: I will eat some crow. Bartel punted really good this year and earned the punting job. I have full faith in Crapigna. I do like how we are keeping Van Gylswyk to groom him as our future kicker. The Riders close out the preseason on Saturday when they travel to Edmonton for Chris Jones' first return to Edmonton. I think the whole "Chris Jones return" will be much ado about nothing (its just preseason for god sake) but if people choose to boo Jones I don't think we in Rider Nation are in any position to judge. We are not exactly know for being quick to forgive and not hold a grudge. I would like to say I'm looking forward to watching the game but because we are apparently stuck in the stone ages I will be forced to listen to it on the radio. Honestly why not just have carrier pigeons deliver the play by play? For all the ways sports teams have figured out to gouge money out of us, I can't understand how no one has clued into the money making potential of this preseason game. We are a province desperate for football. If they charged $10 to access a live stream of the event I bet they would make good money. I mean I'd prefer if they were forward thinking like the Ti-Cats and offered the live stream for free but I would be willing to pay for it. Heck I would pay someone to periscope it from their phone. But I digress. Of course Saturday is Durant's big tune up. All the camp reports about him have been glowing but it will still be good for him to get on the field in real live action. I'm not looking for him to light it up. He just needs to get comfortable and start to get in sync with his offensive weapons. That said if he threw for 500 yards and 8 TDs in a half of football it would certainly help put Rider Nation at ease (though some would likely still be calling for us to get rid of him... this is Saskatchewan after all). - Import Receiver - There is an opening for a 3rd import WR alongside Chiles and Roosevelt. Guys like Collins (despite his big game 1 fumble), Lankford and Denmark are in the mix there. I honestly think Denmark faces the biggest odds but if Collins and Lankford can't establish themselves we may opt for the reliability of Denmark. - Cdn Receiver - Not the most high profile position but we will need depth behind Bagg, Chambers and Demski. I think Stanford is the lead horse in this race but Kawamoto (which I'll just say it, sounds like a car brand not a football player) has been impressing the coaches so this is a close race. - D-Line - Odds are, we will run a 6 man rotation. Lemon, Cappy and Irvin are entrenched and White seems to be securing that last starting spot (though perhaps Jonathan Williams changes that). The 2 rotation spots (possibly a 3rd depending on how we structure the roster) are wide open. Imports like Newsome and Leonard are in the mix as are Canadian like Hazime, Ainsworth and Kashama. Tough decisions are coming here so that will certainly be something to watch... err listen for on Saturday. - Secondary - For me this is the toughest group to predict. I assume Hollins, Gainey and Brooks are viewed as starters. That leaves Walker and Cox battling it out of the last starting spot. I am also getting more curious just how serious we are about this Kevin Francis at safety thing and what role we have for Newman. That doesn't even get into the back-ups and guys like Webster, Campbell and the imports. Many different combinations could result here and not many would surprise me at this point. Hopefully some clarity will emerge here on Saturday. - Back-Up QB - I left this until last because I'm almost sick of talking about it. Is it too much to ask for one of our QBs to look mildly competent? Don't even care who at this point. Maybe Coleman starts throwing to the right jersey colour. Maybe Smith actually makes a decision. Maybe Sims never gets sacked because opposing defenders just assume he is a lineman and doesn't have the ball. I still maintain that they want Coleman to be the guy but if he doesn't start making better decisions you almost have to default to Smith given his legs and improvisation at least until we can find a viable alternative. Who knows with any luck both QBs will play considerably better and change this discussion for the better. As the CFL season gets closer, more and more people's fantasy drafts are taking place or being scheduled. Be sure you are prepared for yours. 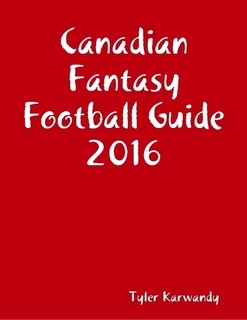 Buy a copy of my 2016 Canadian Football Fantasy Guide. It's 40+ pages including analysis, rankings, stats, sleepers and cheat sheets. All for just $7. As an added bonus, I update the guide every Sunday and if you purchase now I will send you the updated copy of the guide. This way you can get your fantasy football info right now and still rest assured that you will keep up to date with things like injuries and cuts. Visit http://www.lulu.com/shop/tyler-karwandy/canadian-fantasy-football-guide-2016/ebook/product-22749551.html to get your copy now. Well that was certainly a fitting way to open the farewell season at Mosaic Stadium... an extended period of boredom and nothing happening... followed by a power outage. I'm kidding (mostly), even if it was not the greatest performance I was just happy to be back in the stands cheering on Rider football. There were some good things, there were far more bad things but at the end of the day I think we can all agree that we should be mildly concerned that our power system is not able to withstand confetti. I bet Chris Jones inquired about his ability to cut Sask Power given all his supreme overlord status. There is a provincial tradition that follows the first preseason game that you can count on like clockwork and that is people grossly overreacting to the results of a meaningless game. Had we won, Jones would have be hailed an unstoppable force, recruiting guru and the printing of a banner featuring him to adorn Mosaic would have been called for. Because we lost, the thoughts range from we've clearly made a mistake in hiring him to we are in for a worse season than last year. As with every year, the truth lies somewhere in the middle. There were certainly some concerning things but remember that its a meaningless game where many key players had little to now involvement and we were playing with a drastically reduced playbook than we will have come regular season. - Our starting defensive line looked really good (and that was without Cappy and Norwood). If what I saw was preseason Shawn Lemon than I am pumped to seem him when the games are for real. I also noticed Marcus White on a number of occasions. I would not have pegged him as a front runner for the DT spot when the year began but he's certainly fighting hard to earn it. - I thought the starting O-line overall looked good... at least when they weren't forced to block for a ridiculously long period of time by their QB. - From the "guys we've gotten used to being awesome" category: Rob Bagg will do great things in the slot. Levi Steinhauer was a impact player on special teams. I maintain that Otha Foster is a very underrated signing. - From the "new guys who caught my eye": Terrence Cobb was a solid runner. Reminds me a lot of Anthony Allen, not a game breaker but a stronger guy who consistently chews up the yards. Dillon Grondin does not look out of place on the field. Certainly has room to grow but you can he belongs out there. Xavier Walker played a lot but I didn't notice him much... for a DB I'll take that as a decent sign. - The Riders are currently researching steroids and how to be drug tests because after watching our back-up QBs play, Darian missing a game is not really an option. BJ Coleman just made terrible decisions. There was only one pass he was able to complete and he did it for pretty much every single completion he made. Brett Smith... well he was Brett Smith. One read, panic, start dancing around and hope make a play with his legs. I did appreciate when he channelled his inner Durant and out wrestled that sack. Smith needed to show he had progressed as a QB and thus far it would appear he has not. The only reason both of them are still employed is because the only other QB option looks like he's only there because he ate any other QBs ahead of him on the depth chart. I'm not about to panic as its still early and the QBs have another game to prove themselves but the early signs would point towards "screwed" if either are forced into action at this point. - With the QBs both playing bad its tough to get a solid assessment on one receivers. Chiles struggled mightily early but showed a flash when he ripped that ball away from the defender. Denmark adjusted well to a terrible under-thrown ball and turned it into a TD. As a 30 year old guy not currently with the starters, he's in tough to make this team but he's the type of quite reliability we may just decide to keep around if the new WRs don't step up and seize their chance. - Secondary had its ups and downs (and admittedly you can never get a great read on a secondary when they are playing a reduced playbook). Not sold on the Kevin Francis at safety thing yet as I honestly had to keep looking to see if he was even on the field. Some miscommunications (which are expected at this point. Ed Gainey showed signs of the Gainey-like tendencies that have led me to not be his biggest fan: penalties, failing to make a play on the ball. Overall it was not a great game but if you add competent QB play (i.e. Durant) then it completely changes the complexion of the game. Anyone who thought the Riders would be world beaters right form day 1 (which certainly wasn't me) got brought back down to earth a bit. I see no reason for panic but we do still have areas that need work. I'll wait until I see how the performance in the second preseason game compares before joining the "grossly overreacting crowd"
Since this is the preseason I will once again be playing the Official Rider Prophet Preseason Drinking Game and I encourage you to play along… unless you need to drive or function coherently the next morning. Here are the rules. Enjoy and see you in the stands! 4. Every time count, illegal formation, no yards, offside penalty you drink. Two if its on the Riders Double if its too many men. 7. If a player who is not dressed gets credit for a stat or penalty you drink. You want to know how much I’ve missed football? Wednesday I my kid had soccer practice so I PVR’d the Bombers/Als preseason game so I could watch it in its entirety when I got home. I swear another football-less month and I would have started filming my boy’s flag football games just so I’d have something to watch. Saturday night we get to return to our beloved seats at old Mosaic Stadium… at least those of us who aren’t at Garth Brooks, Meatloaf, a wedding, scared off by the chance of rain or generally too lazy to leave the couch given that’s its televised. Me, I’ll be in the stands soaking it all in... and if anyone has some oversized novelty scissors I could borrow that I can display when someone commits a cutable offense that would be just swell. Preseason is our chance to the players we’ve been hearing about for weeks in real live action. It’s their big audition and some will seize the opportunity and come out of nowhere to secure a roster spot (ala Kory Sheets ’12), others will blow the opportunity that Jones may cut them before the game even ends. Remember when Quentin Griffin decided he was too good to play in preseason? - Secondary: Gainey, Brooks and Hollins are set in their spots. Newman being injured has muddied the water for me on if he will be the safety or if he we play at other positions. There is also a CB spot sitting vacant with guys like Cox, Jackson, Dean and Dixon competing. Also interested to see how serious we are about this Kevin Francis at safety experiment. - Back-Up OL: I have reasonable confidence in our starting 5. However, my confidence level should one of them get hurt is somewhere between my confidence that Josiah St John will be named player of the game and my confidence that drink prices will actually be lower this year. Its actually not quite that bad, having Andrew Jones is really nice but I would really love to see a young Canadian like Picton, McKay or Adams establish themselves as a reliable depth option. Hopefully an import tackle can look good enough to keep around until Jarriel King is healthy again. - Back-Up LBs: I love our starting 3 (assuming Knox gets healthy at some point... slowly starting to get concerned there). But after that "Prayer" and "Pump the starters full of steroids and hope they don't get randomly tested" are my leading back-up plans. Marte Sears sounds to be developing well as a patented Chris Jones utility defender. ALso going to be closely watching Sam Eguavoen and Canadian Dillon Grondin. If those guys live up to some of the training camp hype (Grondin espcially) it would really help calm my nerves on this group. - Back-up QB: Almost wasn't going to mention this as the media has been all over it. I get it, Saskatchewan loves, loves, loves back-up QBs (except Sunseri, in a rare united stand we all hated him). This will be a good battle to watch. Coleman has got a lot of good reviews in camp and I think has the inside track on the back-up job. However, Smith has reportedly grown from last year and he always seems to raise his compete level when the lights go on. Its nice having actual tangible competition this time around. - QuDarius Ford - word is the guy can fly. He's in tough with Kendial Lawrence entrenched as our returner but I'm curious to see his speed first hand. - Jonathan Newsome - Chris Jones loves to rotate the D-line. Look at what he did with Willie Jefferson in Edmonton last season. Newsome has an impressive resume. Curious to see how that translates into a real (or at least quasi-real) CFL game. - Ino Vitale - He's a big scary looking Samoan. Based purely on that I want him to be awesome. (you won't find this kind of insightful analysis anywhere else). - AC Leonard - I initially brushed him off as a liekly early cut given that he was a converted WR/TE but he has better getting some very solid reviews in camp along the D-line. Make sure you have a roster because unlike normal preseason games where by the 3rd quarter you don't recognize anyone, you will probably need a roster right from the first snap. With Durant not playing like half of the players people will actually recognize are gone. Either way sit back and enjoy the first Rider football of 2016... which will likely be followed by a predictable "I knew Jones was a bum" by some if we lose this meaningless game. We are one week in to training camp and I think one thing both the players and fans can agree on is that we just want it to be game time. Don't even care if its preseason ball. Before we get to my normal sentimonies, I wanted to give a shameless plug for my 2016 Canadian Fantasy Football Guide. It's available now for the a special limited time price of $5. It's a must have if you are into Fantaseh or some other form of CFL fantasy football. All the details can be found here. Now that this brief commercial message is over, we return to your regularly scheduled loosely coherent rambling. While there still is much to be settled in the weeks leading up to the regular season, I will do my best to bring you up to speed on what we know so far. What do we know? That the teams' performance in the Green and White game this weekend made Coach Jones want to throw up. Kinda curious what his comments would have been on our regular performance last season would have been at that rate. Saturday's preseason game will certainly go a long way to separating the top players from those who will join the exceedingly long list of Chris Jones cuts. For today I figured I would highlight one player per position that has been getting a lot of positive attention so far. They are names you might want to start getting familiar with. Not sure if he will be able to unseat Brett Smith for the back-up spot but he will be making this team. He's a good pocket passer with a strong arm and good accuracy. That said I hope the preseason game is the last time I see him throw. Tons (and I mean tons) of love for Roosevelt but we all knew he was good. I wanted to instead focus on a new name. Lankford is not a newcomer per say as he was with us for for of last season (dressing in 1 game). He has been getting a lot of practice reps with the starting unit and has been making enough plays that you can tell he's not relinquishing the spot without a fight. I had a hard time coming up with a name here as I'm convinced Steele (with a smattering of Walter) is going to be our RB. Unlikely Hebert makes the team unless its on the PR but he is an extremely fast player who has broken some big runs in camp. The caution here is that most RBs look good in camp when people can't hit them for real. Preseason is when you really find out about how good the RBs are. Our starters will be the same as last year with the exception of Thaddeus Coleman taking over right tackle. So while McKay is fighting for a back-up spot, I highlight him because I hear his name come up a lot. He may be a developmental project but unlike some unnamed other OL draft picks from this season, he is actually in camp and getting some positive attention. From the famed Kashama family (which has produced many football players) this former RedBlacks draft pick has had an impressive camp so far. We are a team that can use all the Canadian help we can get so Kashama is potentially a very important player in our D-line rotation. I have repeatedly said that our depth at Canadian LB scares me more than be forced to listen to Rod Black for 24 hours straight. So I am tremendously excited when I hear that some obscure LB from the Windsor Junior program is having a solid camp. He has been mentioned by coaches and media throughout the past week. It would be a huge boost to our Canadian content if he can fill a much needed depth/special team spot. He got a lot of hype coming our of mini-camp (but I don't put a ton of faith in that) but he has carried it through to training camp. He's versatile guy (LB, pass rusher, can cover) and he's tall. He's the type of multi-use defender that Chris Jones loves. I swear this is not just because of his name (but seriously can you imagine how much fun I could have with a name like that?). There is an open battle in our secondary (mainly for the last CB spot) and Cox's name has come up on a number of occasions as playing well. Kendial Lawrence will be our returning so he's in tough but QuDarius Ford has caught a few eyes with his speed and elusiveness. Watch him in preseason because its easy for a returner to look good against his own teammates who aren't hitting for real. Should mention that I assume his older brothers are O'Darius and P'Darius and his younger brother R'Darius. Can't wait for Saturday to see these guys (and everyone else) in action. Hot off the press (at least the metaphorical one since this is all done online these days) the 2016 Edirtion of my Canadian Fantasy Football Guide is now available to download. It's over 40 pages of stats, analysis, player rankings, sleepers, busts and cheat sheets. Everything you need to succeed in your fantasy leagues this season. All for a very low price. As an introductory special, its available for $5 this week only. (Next week the price will be $7). But wait there's more! I update the guide every Sunday (based in changes in training camp and preseason games). if you purchase now, ont only do you get the sale price, save your receipt and I will email you updated versions of the Guide as they are released. It guarantees you the most up to date info. Visit http://www.lulu.com/shop/tyler-karwandy/canadian-fantasy-football-guide-2016/ebook/product-22733816.html to download now.